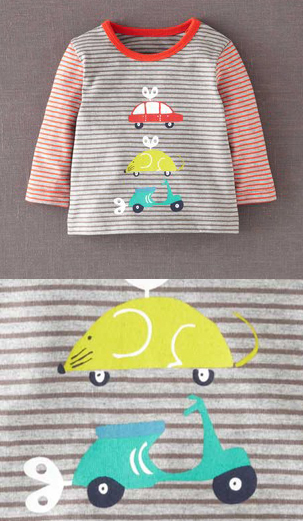 Oodles of adorable scooter clothing for kids has been released by Boden. Here are some examples that we’ve featured in the past. Now here’s the latest – a toy wind-up scooter being kept company by a wind-up mouse and a bubble car. Sizes range from newborn to 2-3 years. Get it for $15.30 here. This entry was posted in Clothing and tagged baby, boden, clothing, infants, kids, scooter, shirt, toddlers, vespa, wind-up toys by Tracy. Bookmark the permalink.